Click here for the "Surviving Road Engines" index page. 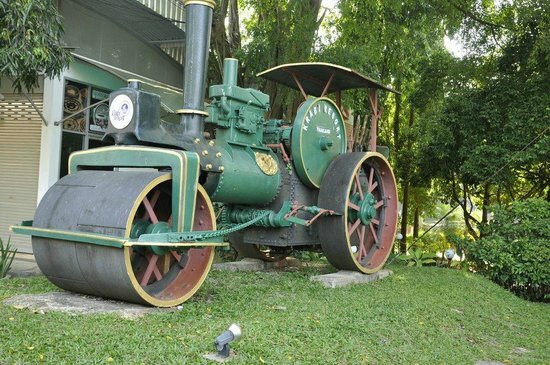 Please see also my list of preserved and extant steam locomotives and steam cranes in Thailand. I would like to acknowledge the help given in assembling this list by Derek Rayner, Chris Grimes, Peter Green, John Tomlinson, Ray Gardiner, Shane O'Neill, Peter Busby, David Welch, Michael Pass, Mark Robinson, Chris Yapp and David Bosworth. A survivor for which more information is needed (updated 18th March 2017). Click on a thumbnail for a larger picture, then click the link or the 'back' button to return to this page. A number of rollers carry a painted numerical code aa (30) - bbb30 - 00cc - dd (Date = 19xx) where the initial 30 seems to indicate a (steam) roller, the next three digits the maker, the next four digits are specific to an individual roller and the last two show the date. The painters have got it wrong on occasions, of course. Please look carefully for this and try to include this code in any pictures you send me. IMPORTANT - Albaret rollers have often been reported as '1926', this actually refers to the decree which required the boilers/fireboxes to carry an identification plate. The Thai examples were all supplied in the first half of the 1950s, often the small circular boiler disc has just "53" or similar for the year of build on it. Will future visitors please check this. Works number 1953 (of 1953) also went to the Far East (Indonesia) but is now in the UK, via Australia; as one of a trio from this period that were sold on to Australia. 1 Tak Highways Division 1 Albaret - Rantigny, Oise, France 1637 195? Earliest identified Albaret in Thailand. Location N 16° 47' 55.392920" E 99° 9' 4.455699"
4 Highways Office, Lampang Albaret - Rantigny, Oise, France 1955 195? At Highways Department, just north of town centre. Carries a Kian Gwan, Bangkok agents plate. 8 Saraburi Albaret - Rantigny, Oise, France 1966 195? Highway Offices, Saraburi, about 3km north of the railway station on Highway 1. 9 Surat Thani Albaret - Rantigny, Oise, France 1969 195? Highway Offices, Phun Phin, about 1km from the railway station in the direction of the town. 12 Mae Tha Highway Depot, Lamphun Albaret - Rantigny, Oise, France 1982 195? Type BM, carries a Kian Gwan, Bangkok agents plate. 13 Highways Office, Uttaradit Albaret - Rantigny, Oise, France 1983 1953 Type BM, carries a Kian Gwan, Bangkok agents plate. Bangna Trad / Srinakarin Junction, Bangkok. 16 Lom Sak Highways Dept Albaret - Rantigny, Oise, France 1987 195? Not actually in Lom Sak at all, but alongside the main road (12) a few km further East, towards Nam Nao, by the traffic lights & junction. 18 Highways Office, Si Samrong, Sukhothai Albaret - Rantigny, Oise, France (likely 195?) One of the later machines with a cylinder on the canopy roof. 19 Highways Office, Chiang Rai Albaret - Rantigny, Oise, France (likely 195?) One of the later machines with a cylinder on the canopy roof. 20 Kamphaeng Phet Highway Department Albaret - Rantigny, Oise, France (likely 195?) Location N 16° 26' 20.747478" E 99° 30' 29.523299"
22 Krabi, Office of Highways Department 17 Albaret - Rantigny, Oise, France (likely 195?) On the right hand side of the road to the airport at Nuea Khlong. Not yet visible on Google Streetview. 31 Wiang Sa, Nan Aveling-Barford AH430 1950(?) Head north from the cross roads in the centre of town and it's on the left after about 100 metres. Thought to be the newest surviving steam roller from Aveling Barford, a title previously held by AH425 in the UK. 34 Mae Moh Mine Museum near Lampang Aveling-Barford See this picture which led to the identification of its location. 42 (near) Chiang Mai Aveling & Porter On the 1006 road, some 3km east of San Kamphaeng and about 20 km east of Chiang Mai, outside the Highway sub-district office. For a 2008 picture on a different base see Picture on http://www.pbase.com/win13/image/92569427 . Derek Rayner thinks it is probably 3305/1893. Derek Rayner thinks it is probably 2469/1889. Pathumwan Institute of Technology, permission needed to enter. Formerly at the National Science Education Centre, Ekamai, Bangkok (shown here). Robert Whitehead adds: This is an 8 ton three shaft roller, with single cylinder, code-name 'Prince'. It was sold to the Royal State Railways of Siam, Bangkok. Two cylinder compound. Plinthed in the Highways Office gardens. On the left at the end of highway 22 from Udon Thani, where it meets the main road into town, opposite the 4 columned ornamental arch. 72 (near) Chiang Mai Ruston & Hornsby, Lincoln, England 143152 ca 1926 10km north of Chiang Mai on right side of highway 107 to Mae Rim opposite Don Kaew Community Hospital. 73 Highways Office, Phitsanulok Ruston & Hornsby, Lincoln, England 1926 See this picture and this picture and this picture. Viewable in Google Streetview. Ruston & Hornsby, Lincoln, England 10km south of the town on the Khon Kaen road, incomplete. 75 Phichit Highways Department Ruston & Hornsby, Lincoln, England GPS Co-ordinates: N 16° 21' 24.709086" E 100° 22' 16.989188"
Information please on this one! The following pictures shown part of a Henschel compound roller preserved in Chiang Mai - for the location see note 29 at the bottom of the preserved Thai steam locomotive list. 102 Kanchanaburi War Museum. Derek Rayner's best guess is that it is from a Marshall steam roller. 103 Song, Phrae County (see link right) Ransomes, Sims and Jefferies 32013 1920 More information and pictures are available. According to David Parfitt / Derek Rayner this is a Marshall 'Gainsborough' type. 22 km east of Ubon Ratchathani on Highway 217 Garrett ca 1924 By the entrance gate to the Department of Agriculture Crops Research Centre. More information and pictures are available. Clayton and Shuttleworth, Lincoln England Spotted in a municipal yard in 1987. Spotted in a municipal yard in 1987.